One of the things that social media is gradually added in common users, since the most famous are Twitter and Facebook, as we always find new applications that offer interesting options. Well if you have Facebook friends who do not know if you have Twitter, then Friendlynx going to help in the social way. Friendlynx is a web service that helps us see the Facebook friends who have Twitter and that do not follow; it operates using first and last name, but apparently has a high hit rate. 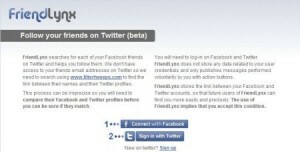 So you have no excuse to have your good friends in facebook and twitter.